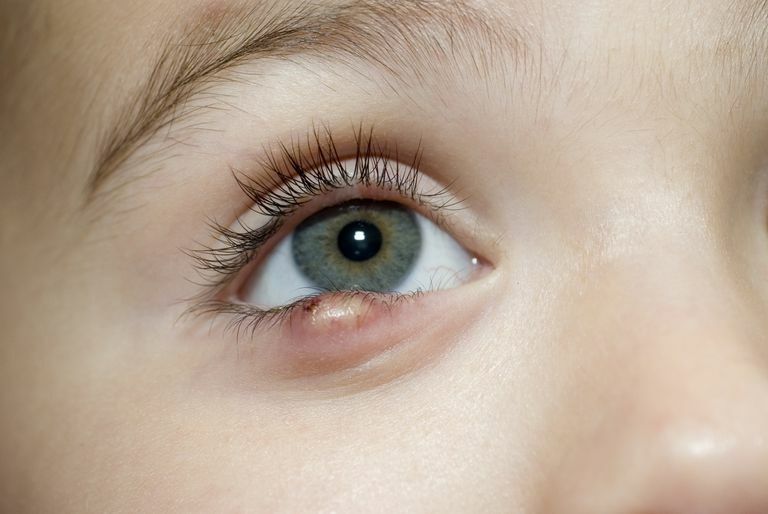 Does your child have a small red bump or swollen area on her eyelid? Most likely, it's something called a stye (also called a hordeolum) or a chalazion. These are common in children, usually easily treated, and rarely serious. Chalazia: When an oil gland becomes blocked, it is called a chalazion. A chalazion tends to look swollen, tender, red, and lumpy, and sometimes it can grow as large as a pea. Styes: When a gland becomes infected, it is called a stye, or hordeolum. The infection is generally caused by staphylococcal bacteria. This also produces a red, swollen lump, but it can be smaller than a chalazion and it's usually located on the edge or the inside of the eyelid. It also tends to be closer to the surface of the eyelid than a chalazion. A stye tends to be painful, while a chalazion usually isn't. A bump on the eyelid, sometimes becoming red and swollen and tender. Your pediatrician can diagnose a stye or chalazion simply by looking at it. No other tests are necessary unless there is a concern that it's something more serious. Don’t try to squeeze or pop a stye or chalazion. This can increase the risk of infection and can also spread bacteria to the other eye. A chalazion or stye will usually disappear on its own within a few days or weeks, but using warm compresses can speed healing. To make a warm compress, dip a washcloth in warm water (you can even throw some mild soap in there, to keep the eyelid clean), wring it out, and then have your child apply it to the affected area four to six times a day for 10 to 15 minutes at a time. The warmth can be soothing, and, in the case of a chalazion, can loosen the hardened oil and allow it to drain. Styes that don't go away on their own may need to be treated with antibiotic eye drops or an antibiotic ointment. If the infection spreads outside the eye, the doctor may advise taking an oral antibiotic pill. In rare cases, a doctor may need to drain a stye by using a small scalpel. Styes normally heal on their own within a few days or so after draining. Call your doctor if the stye doesn’t go away within one to two weeks. The best way to prevent styes and chalazia is by practicing good hygiene. Prevent the spread of bacteria by having your child wash his hands regularly and avoid touching his eyes in general. Neither chalazia nor styes are contagious, so having one should not prevent your child from attending school or being around other kids. If your child has been using a warm compress several times a day for two consecutive days and you're not seeing any improvement, or if symptoms are becoming more severe or spreading to other parts of the face, call a pediatrician or a pediatric ophthalmologist (a children's eye doctor), as further treatment may be necessary. American Academy of Opthalmology. Chalazion and Stye Symptoms. Merck Manual, Consumer Version. Chalazion and Stye (Hordeolum).